Udi's recently hit our Eastern Iowa shelves, and while I was late on the bandwagon, I had to give it a try! My hesitation with purchasing this bread was my ongoing disappointment with all the pre-made gluten free breads I have tried. End results always pointed to the same conclusion...homemade is better. My favorite premade gluten free bread is the French Meadow Bakery multi-grain gluten free bread. 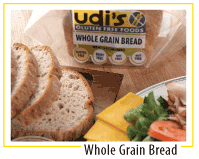 While Udi's bread is good, the pieces truly are tiny and the amount of fiber in their whole grain bread is only 1g per serving. With French Meadow Bakery, you get a much more impressive 3g of fiber per serving. Fiber is sorely lacking in the gluten free bread market, as is protein, often times. If you can tolerate the corn flours used in this bread, it makes for a very nice and easy treat. While I would enjoy the ease and taste of either of these, I still prefer homemade bread mixes for the warmth, texture, and flavor. It's hard to beat the smell of freshly made bread. I find Pamela's, Breads From Anna, and Bob Red Mills Whole grain mixes are all quite tastey. The added benefit of making the bread from scratch is that you can add in some protein and fiber with the baking process through the addition of coconut flour (fiber), ground seeds, nut flours or bean flours. If you are buying a premade gluten free bread that is low in fiber, consider topping it with hummus, homemade bean dip, or top that nut butter with ground flaxseeds for added fiber!